Undeniably, reading is an essential skills for every child. There are many ways to teach a child how to read, with common methods involving flashcards, rhymes, and bedtime stories. But there is also a lesser known technique — one that encourages kids to write to read. This same technique is the basis of the app Write to Read. Created in cooperation with researchers from the Danish School of Education, Write to Read is a unique app that was developed based on a scientific finding that children learn to read faster when they learn to write at the same time. It proposes that as kids write stories on their own, they will also make the connection between letters and sounds without having to depend on instructions from adults. The app facilitates this learning process by allowing you to create books that your junior fills with his/her stories and pictures. The story can be about anything — family, holidays, pets, toys, or any other things that your child finds interesting. You start by giving your storybook a title, a cover picture, and the author’s name. Next, you add more pages to build your story. On every page, there is a placeholder for an image and a set of two text fields. The first text field, marked with a picture of a baby owl, is for your junior to type in some caption for the picture using his current level of writing abilities. At this point, you should just let your junior compose as they like and not worry about misspelled words. Once he has finished writing, it is your turn to type in the same text, but with proper spelling and grammar, into the second text field. Through this activity, your child is actually experimenting with letters and sounds, and building the basis for their reading skills. Seeing his writing alongside yours helps him figure out how much he's got right. To further assist your child in making the connection between letters and sounds, the app provides a special keyboard that pronounces the alphabet names or phonics as you press the keys. The app also differentiates between vowels and consonants by showing them in red and blue, respectively. Finally, you can also add a sound recording to each page. It is also possible to decorate your image with frames, title labels, and text bubbles. Once your book is completed, you can convert it to PDF and share it via email. It is also possible to go back and edit a saved book by accessing the Library. Write to Read was developed for kids ages three to ten. As you may conclude from my description of the app, parents play a great role in ensuring that the app works as intended. It is imperative that parents accompany and guide their children while using the app, so make sure to set aside enough time periodically to maximize the learning process. If you are interested in reading more about the design process behind the app, there are some interesting articles on the app’s official website. If you are just getting started with the app, you can check out the Good Advice section, which contains a list of comprehensive tips for getting the most out of the app. You can also watch the appealing Instructions video with your child to explain the whole process to him. To be honest, I had my doubts when I first tried out Write to Read. Getting kids to write before they are able to read seemed backwards to me. However, after trying out the app for a while, I have to say that their hands-on, learning-by-doing approach is really interesting and effective. What I like best about the app is how parents are heavily involved in the learning process. While I am aware that kids can learn to read at school, I have to agree with the app developers about how kids can absorb the skills better in an informal environment when they believe that it is natural to use the written language. Besides having great educational value, I also find the app inspiring. It is always interesting to see the kind of stories that children can come up with, and the app makes it easy to write them down. I appreciate the inclusion of an export/print feature, and I know several parents who will share the same feeling. I also think the app is thoughtfully designed. It has a friendly user interface, so juniors should have no problem navigating through the app. Creating a book, entering text into a page, adding pictures, and recording your narration are pretty straightforward. The talking keyboard is really useful as well. The only item on my wishlist right now would be for the developers to add a way to draw an image directly on each page. While I appreciate the feature for using your own photos, I think it would be nice if kids can make their own drawings. Write to Read is an interesting app with a big promise. The idea is quite fresh, and it’s nice to see an educational app that was designed so thoroughly. Feature-wise I think the app makes it easy for young juniors who are only learning to read and write, but what I like most is how the app provides parents and children with the opportunity to interact with one another. I would highly recommend it. 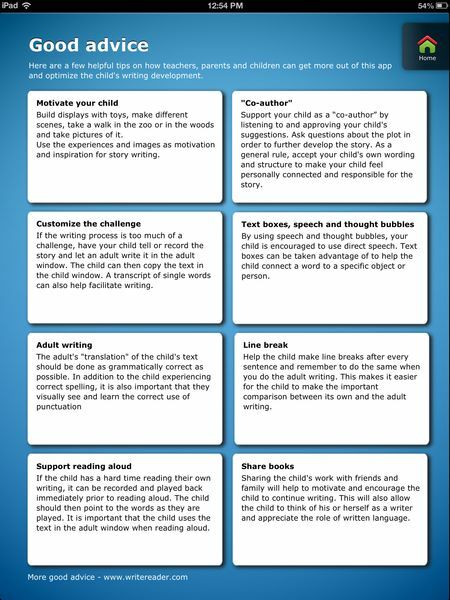 Get Write to Read on the App Store. Thanks to Writereader Aps for sharing the storybook with us. Monkey Word School Adventure. 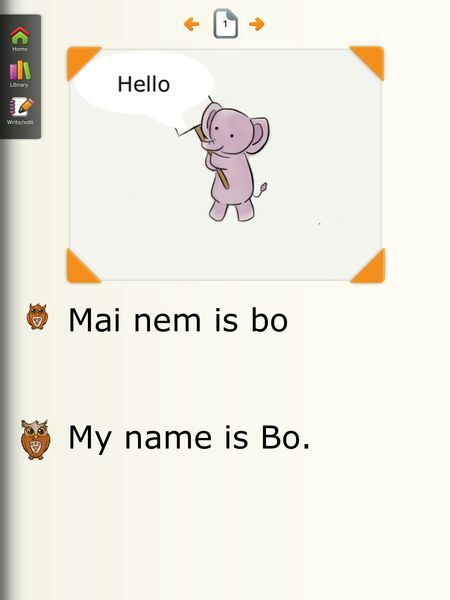 Upbeat jungle-themed app introduces juniors to the basics of reading and writing. LetterSchool. Beautiful app makes writing letters and numbers fun and intuitive. Gappy’s First Words. Help Gappy get home by spelling sight words!